Venison is an excellent high protein dog food. In fact, as a limited ingredient dog food, venison contains more protein than any other red meat. Healthy dog food should give your pup high energy through an iron-rich protein. Venison makes for the healthiest dog food, as no other red meat provides as much iron or Vitamin B. To balance this high-energy dog food, we’ve made our venison formula grain free, to avoid any potential pet food allergy. 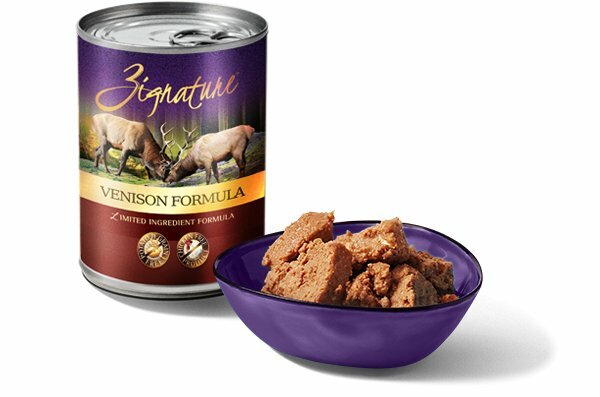 From large sized dogs to medium sized dogs to small sized dogs, our venison formula provides a great source of nutritious energy. Venison, Broth, Peas, Sun-Cured Alfalfa Meal, Chickpeas, Tricalcium Phosphate, Agar-Agar, Salt, Potassium Chloride, Flaxseed, Choline Chloride, Minerals (Zinc Proteinate, Iron Proteinate, Copper Proteinate, Manganese Proteinate, Sodium Selenite, Calcium Iodate), Vitamins (Vitamin E Supplement, Thiamine Mononitrate, Niacin Supplement, Calcium Pantothenate, Biotin, Vitamin A Supplement, Riboflavin Supplement, Vitamin B12 Supplement, Pyridoxine Hydrochloride, Vitamin D3 Supplement, Folic Acid).